During the days of slavery in the United States, the only meat that slaves had access to was chicken, because it was very cheap. During this time, the tradition of frying food was really taking off in the American South. Because of this, fried chicken became associated with African Americans. Deep-frying poultry is a cooking technique that originated in West Africa and was largely unknown to Europeans until slaves started frying chickens in America for their own food. White people discovered that fried chicken is tasty stuff, but the technique is still identified with African Americans because it originated there. Historically, watermelon was a lower class food that was fed mostly to pigs and other farm animals. Watermelons have become a normal food everyone in the US eats, but it was not always that way. "In general, their living is very poor; scarcely any meat; boiled rice, great quantity of cucumbers, onions, sallad, water melons, or the country cheese (hard sour milk); any of these separately composes a poor Arab's feast." In Europe, watermelons became a stereotypical African and Arab peasant food. This quickly spread to the US. Some writers have stated that it was Africans who first introduced watermelon to the United States. When American slaves won their emancipation during the Civil War in the 1860's, free black people grew, ate, and sold watermelons, and in doing so made the fruit a symbol of their freedom. Southern whites, threatened by blacks' newfound freedom, responded by making the fruit a symbol of black people's perceived uncleanliness, laziness, childishness, and unwanted public presence. The first published caricature of blacks reveling in watermelon is believed to have appeared in an illustrated newspaper as far back as in 1869. 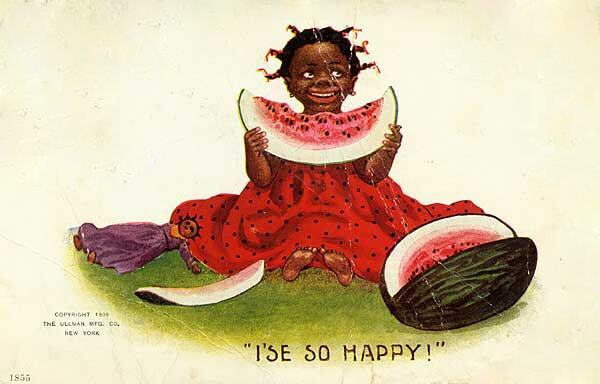 Defenders of slavery used the fruit to paint African Americans as a simple-minded people who were happy when provided watermelon and a little rest. The slaves' enjoyment of watermelon was also seen by the Southern whites as a sign of their own supposed benevolence. The stereotype was perpetuated in minstrel shows often depicting African Americans as ignorant and work-shy, given to song and dance and inordinately fond of watermelon. A lot of very offensive artwork, stamps, and postcards were made along these themes. A 1909 postcard, bearing the caption "I'se so happy!" 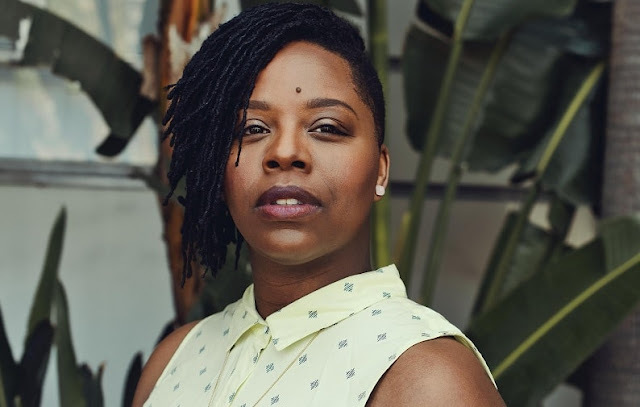 Because the image of a black person liking fried chicken and watermelon is usually used to demean, make fun of, and generalize black people, any of such references has remained a good vehicle for racism. This article was written exclusively for DNB Stories.